Apple has thousands of apps approved for the iPhone and the download count has crossed 2 billion, showing how popular they have been. And still, the best apps can’t be searched easily for every field and topic. 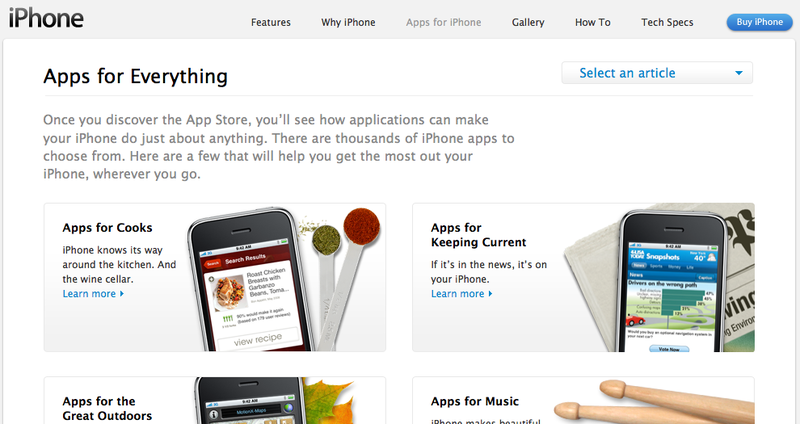 Apple has launched a page – “Apps for Everything” for the iPhone users. Once you discover the App Store, you’ll see how applications can make your iPhone do just about anything. There are thousands of iPhone apps to choose from. Here are a few that will help you get the most out your iPhone, wherever you go. Every page has a few apps very well explained and displayed, and each category has a list of the best 10 paid and 10 free apps, which can make the work easier for iPhone users to search for apps and download them. The best apps list is very helpful as a couple apps in each category downloaded and used, would just show how well you can use an iPhone and get the best of it. You can check the iPhone apps page from here.